​A healthy, well- balanced meal is an essential part of your child’s demanding health needs. Adams County Head Start’s Nutrition Department is proud to prepare and serve your child a menu with a wide variety of low-fat, no added sodium, low-sugar foods. Our menu has been approved by the ACHS Health Services Advisory Committee. Members of this committee include but not limited to, a local pediatrician, WIC and a Wellspan Registered Dietician. ACHS participates in the Child and Adult Care Food Program (CACFP). Each child will be served breakfast and lunch in their classroom at no charge. Teachers, children and volunteers will enjoy each meal together family dining style. During meals the children can practice setting the table and self-help skills such as pouring and serving. They will also have conversations with their friends and teachers during the meal on a variety of topics. All foods served are required to be on your child’s plate. Your child will be encouraged to try all of the foods but they will never be forced to do so. Food will never be used as a punishment or a reward. If your child has a food allergy or requires a special diet we are required to have a written statement from your child’s physician. Join our team as either a Nutrition Aide or a Substitute Nutrition Aide! Be a member of our Health Services Advisory Committee! We meet in the Winter. Meet your child’s friends by dining with them for breakfast or lunch. Share a family recipe that your child’s teacher may prepare as part of a nutrition activity. You will find our monthly menu on the back of your child’s classroom newsletter. You will also find recipes and helpful nutritional guidance in our monthly newsletter article. 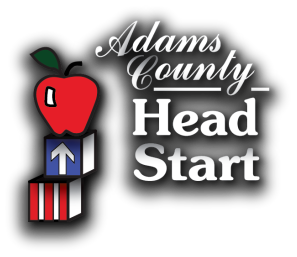 In an effort to keep our children with food allergies safe, there is to be no food of any kind brought in from outside the Adams County Head Start Central Kitchen. If you are interested in participating or have questions for the Health and Nutrition Coordinator, please call (717) 337-1337, ext. 238.